SCP-1081-1 and -2, inactive state. Special Containment Procedures: The two iterations of SCP-1081 currently in Foundation possession are to be kept in an insulated, lead-lined containment locker in Storage Unit 13 at Site 38. Except for experimental purposes, SCP-1081 is never to be exposed to electric current under any circumstances for fear of accidental activation. SCP-1081 is never to be removed from its containment locker except by D-class personnel with noise-canceling headphones active at all times. 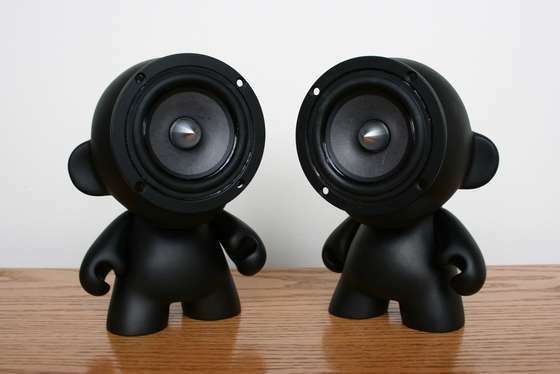 Description: SCP-1081-1 and-2 are identical copies of a black audio projection unit in the approximate shape of a small humanoid, 30 cm in height. Being identical, they can be referred to collectively as SCP-1081. Markings on the speaker's exterior indicate they were produced by a company known as "Echus Projector Combine" in a place called "Abubakari of Deserts" or "ABUDESUS". The speakers have input ports for several unknown types of electric cable, and dials on the back of the "head" for "DENSITY", "RAPIDITY", and a switch that can be adjusted to "INACTIVE," "ACTIVE," "SHUTDOWN," or "REACTIVATE." Though the power requirements of the device are different from any currently known standard, Foundation researchers were able to build an adapter to power the device at █.█ V and ██ A. Similarly, trial and error allowed for the development of input adapters for experimental purposes. Alexylva University's Merry Integrators Player Company welcomes you to a [show, performance, farce]! Please refrain from [thought-provoking? talking, expressing] or otherwise disturbing the players for the duration of the performance. Thank you for your [cooperation, obedience]. Thank you for your consideration during this performance by Alexylva University's Merry Integrator's Player Company! The show is now at a conclusion. followed by a similar whistle sound. Subjects hearing the second message will experience a reversal of their aphasia symptoms if exposed quickly. However, if the aphasia is allowed to remain in place for longer than approximately twenty-four hours, the subject will be immune to the second message and the aphasia is permanent. Moreover, affected subjects after this point will develop deep clinical depression and will frequently attempt suicide within the week; this is believed to be a standard reaction to such a sudden change in one's ability to communicate, rather than a secondary effect. Experimentation has determined that audio recordings of the respective sounds have no abnormal effects; only sounds emitted from SCP-1081 transmit their properties to human subjects. When not exposed to power, SCP-1081 will remain inert except when SHUTDOWN or REACTIVATE are selected. The speakers appear to be capable of producing those two sounds regardless of any external power supply. The devices either possess internal batteries or are capable of drawing electrical power via indirect means from the room around them. Containment is designed to block any possible conduit for electrical transmission to SCP-1081. We have been doing business for a long time, as you are well aware. I swear on the graves of my forefathers that the previous shipment was completed satisfactorily on my end. I have no idea what could have happened We both know the [rumors? tales? ], Aggi. Look at your own people before you blame us. This isn't the first time something has "gone missing" heading in your direction. Barca Magnus alone knows where the [objects? artifacts?] are going, unless your [natural philosophers?] are more precise than is presently believed. Threats and [recriminations?] are unnecessary.